We have been venturing out to San Diego a lot more these past few weeks and love the slight change of direction in content. With my website relaunch coming along soon, I am looking to create more street style as well as beauty and lifestyle segments. It was a gloomy day out in San Diego and we made a quick stop at our local Trader Joe’s to pick up the most perfect peonies. Choosing to include them in the shoot was on the whim but who doesn’t love their flowers hanging out in their handbags instead of vases? 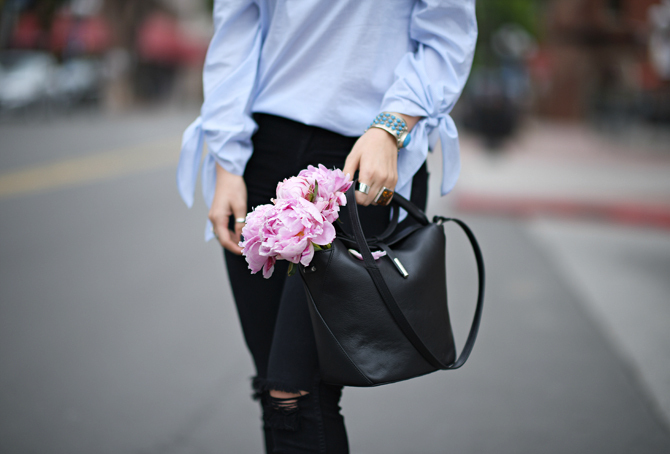 I fully embraced the slight wind and slipped into a favorite pair of distressed jeans and this off the shoulder top. I paired them with these pastel blue suede sandals and they were comfortable enough to walk around all day and still give me an extra push in height. 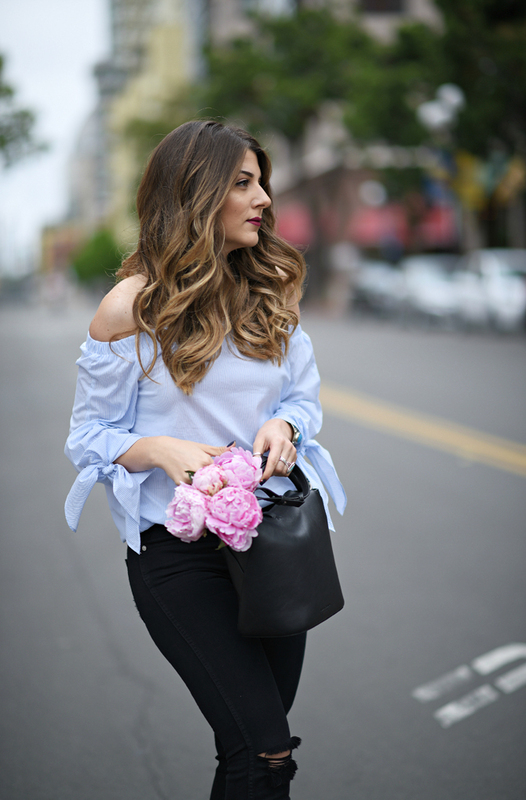 Happy Wednesday!This week it's all about off the shoulder tops. Chic, daring and ultra versatile. I am totally lusting over this trend in every color, print, fabrication..can you tell? I have been wearing them on repeat on Instagram (@Studsandsapphires) and can't seem to get enough. This week has been extra hot in LA and it's been the perfect time to expose those shoulders. I am kicking off a new weekly series where I will be featuring trending items each Tuesday. Granted today is not Tuesday, I was thinking about catchy names and brainstormed anything from Five Favorite Fridays or Tuesday Ten as the category. If you have any suggestions, please leave it in the comment section below and we will leave it (unknown) for now. Have an amazing rest of the day and don't forget to follow me on Snapchat for more daily fun (username: Studs_Sapphires) ! Anytime anyone ever compliments or asks me about my skin care regimen I say “thank you, I take good care of it.” Good skin doesn’t just “happen” and it’s true because there are multiple factors that play a role in good complexion. If I don’t wash my face properly, eat poorly or don't drink enough water one day, my skin will start to break out or look really tired and dry. 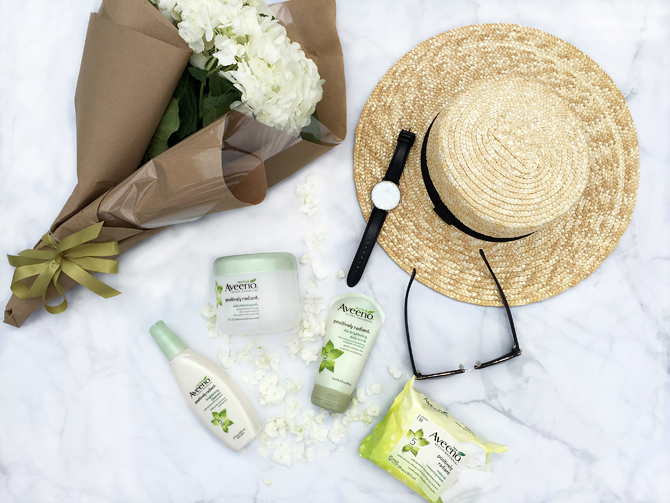 As summer is about to kick into high gear, taking care of my skin is always a top priority. That’s why I have been so consistent with maintaining a skin care routine that I can follow at home and when I am traveling. I am going to give you a peek inside my beauty bag and some of the products I can’t live without. 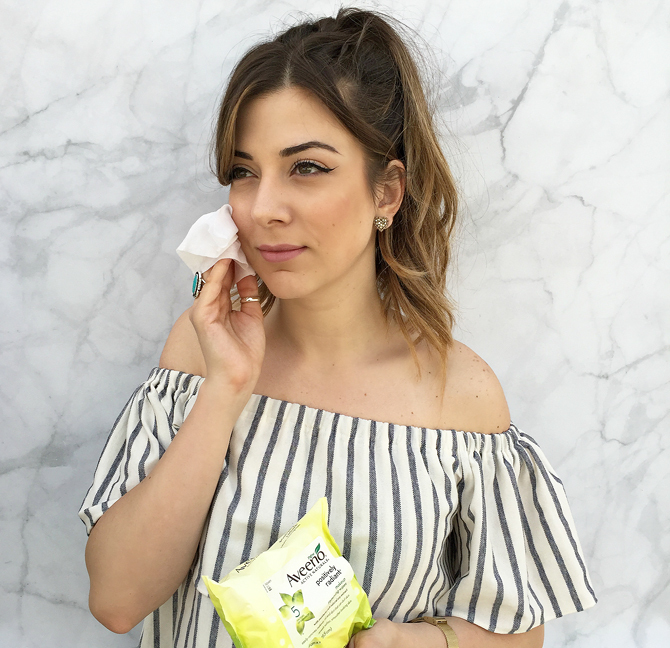 For starters, the best thing ever invented is makeup removing wipes. I started using wipes when I was in college and that was my procedure to remove my makeup on late nights. 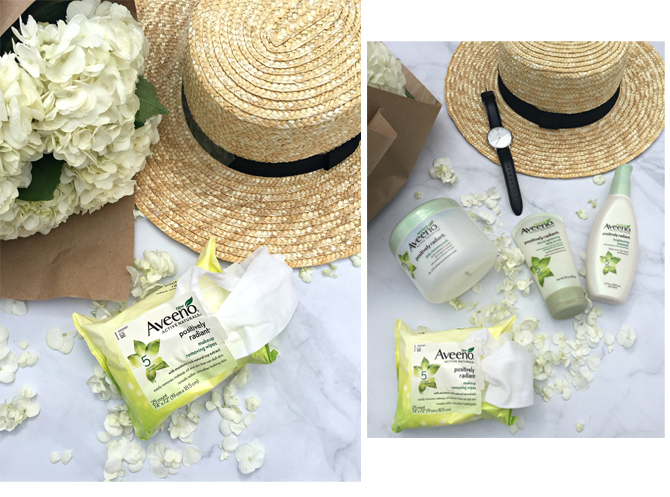 As I got older, I started to include the Aveeno Positively Radiant Makeup Removing Wipes as a part of my everyday routine and the first step towards a clean face. It removes most traces of makeup and its moisture rich while keeping your skin bright and smooth. I rarely travel without these wipes because they are amazing on the go and so convenient! I continue my routine by cleansing my face with the Positively Radiant Brightening Cleanser. It’s gentle enough for everyday and works perfectly without over drying my skin. In addition to cleansers and wipes, I like to use a scrub to exfoliate 2-3 times a week. I use the Positively Radiant Skin Brightening Daily Scrub and it leaves your skin feeling soft and smooth. Although it’s gentle enough to use for every day, I use a scrub 2-3 times a week. 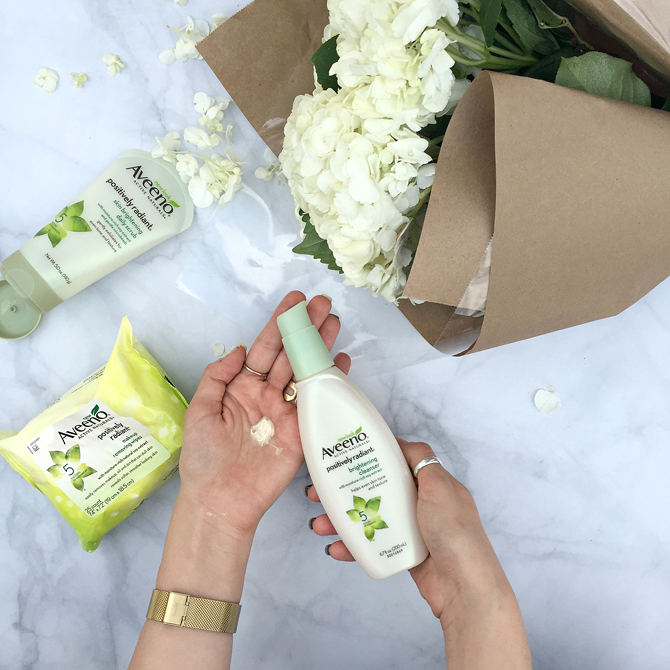 The Aveeno Positively Radiant Collection is light and fresh and keeps my skin hydrated, smooth, and bright all day. Make sure to cleanse your face and you will be amazed how much dirt, oil and makeup these products take off. 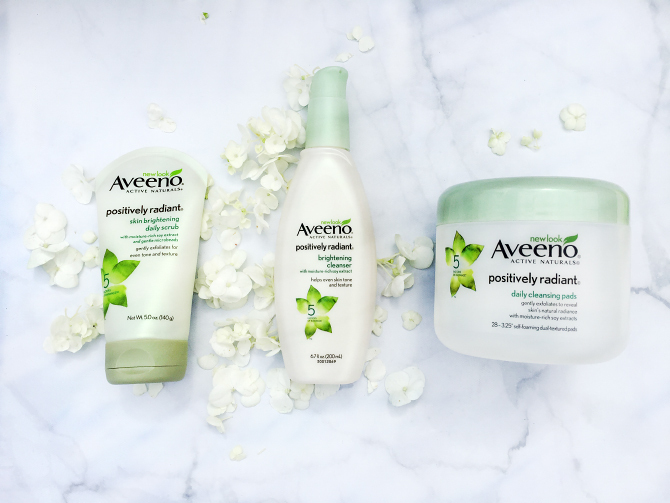 I partnered with Aveeno on this post. All opinions are 100% my own. 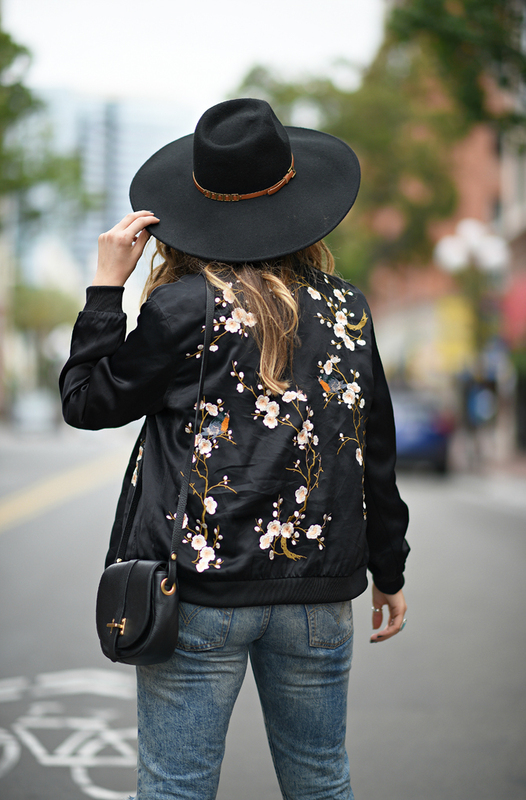 Comfortable, stylish, and chic, it's no wonder bomber jackets have become fashion's favorite new jacket. This style is without a doubt one of my favorite trends for the season because it's sporty, cool and lightweight for spring and summer. What made me gravitate towards this embroidered piece was the vintage feel and the detailing that is bold, yet easy to wear. Bomber jackets merge feminine and edgy details together. This look really describes my style because it's chic enough to walk around shopping on a Sunday as well as go to dinner in West Hollywood. It can be worn super oversized with arms rolled up or a shrunken 90's style silhouette. Don't be afraid to experiment and play with different silhoutettes. 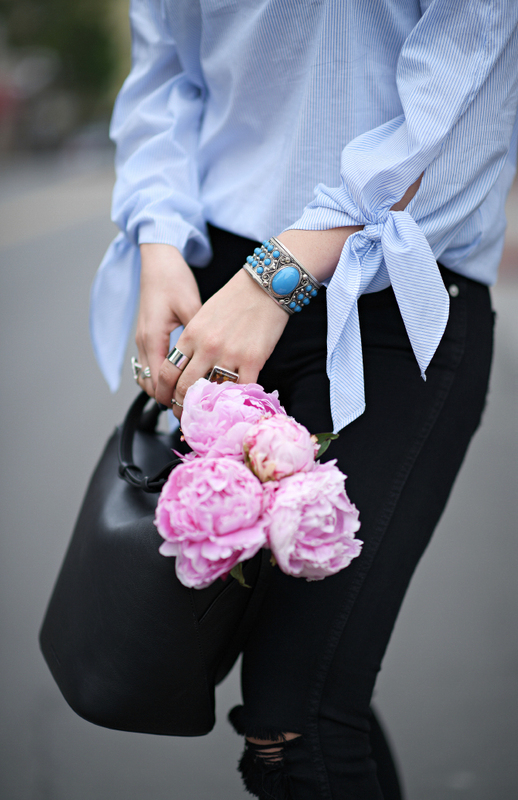 You can throw it on over a slip dress or over shredded jeans.